20,000 Carabinieri (5,000 in Rome) and unknown number of P.S. and troops to be activated in the "Triangle" Exigency plan to counter the coup in accordance with the Piano Solo plan. The Golpe Borghese was a failed Italian coup d'état allegedly planned for the night of 7 or 8 December 1970. It was named after Junio Valerio Borghese, an Italian World War II commander of the Xª MAS unit, the "Black Prince", convicted of fighting with Nazi Germany but not of war crimes, but still a hero in the eyes of many post-War Italian fascists. The coup attempt became publicly known when the left-wing journal Paese Sera ran the headline on the evening of March 18, 1971: Subversive plan against the Republic: far-right plot discovered. The secret operation was code-named 'Operation Tora Tora' after the Japanese attack on the US ships in Pearl Harbor which had led the United States to enter the Second World War on December 7, 1941. The plan of the coup in its final phase envisaged the involvement of US and NATO warships which were on alert in the Mediterranean. However, only a few marginalized sectors of the US Central Intelligence Agency (CIA) were in favour of the coup, while the main response was not to allow major changes in the geo-political balance in the Mediterranean. The botched right-wing coup took place after Hot Autumn of left-wing protests in Italy and the Piazza Fontana bombing in December 1969. The failed attempt involved hundreds of neo-fascist militants from Stefano Delle Chiaie's National Vanguard, helped by 187 members of the Corpo Forestale dello Stato, who were to seize the headquarters of the Italian public television broadcaster RAI. The plan included the kidnapping of the Italian President Giuseppe Saragat, the murder of the head of the police Angelo Vicari, and the occupation of the Quirinale, the Ministry of the Interior (from which Vanguard militants would seize weapons), the Ministry of Defense and Italian public television broadcaster RAI. Milan-based Army dissidents in the Battaltion of Lt. Colonel Amos Spiazzi also planned to occupy Sesto San Giovanni, at that time a workers' town and a stronghold of the Italian Communist Party. Apparently some militants briefly entered the Ministry of the Interior, but Borghese suspended the coup a few hours before its final phase. A gun not returned by one of the militants was later viewed as a key piece of evidence in the later sedition trial. According to Borghese, the neo-fascists were actually gathering for a protest demonstration against the upcoming visit of President Josip Broz Tito of Yugoslavia, which was later postponed. This protest was supposedly called off because of heavy rain. Amos Spiazzi, commander of the Army dissidents, said that the coup was suspended because the Christian Democratic government knew of the coup plan and was ready to suppress the plotters and to declare martial law. This suppression was known in its preparatory stages as exigency operation "Triangle", which would be executed in accordance with the Piano Solo plan and comprised the deployment of tens and thousands of government troops, as well as military and civil police to seize control of political parties and publishers, undertake mass arrests and deportations, and effectively preempt any perceived threats to the civil power. Thus Borghese, lacking the support of Spiazzi and his men; aborted the coup at the last minute as the plotters moved into position. Participants at the semi-clandestine rallies seem to have believed that they would take part in the arrest of politicians and the occupation of key installations by sympathetic army units. When Borghese called off the coup late that night, the presumed plotters, reportedly unarmed, improvised a late spaghetti dinner before returning home. Several members of the National Front (Fronte Nazionale) were arrested and a warrant was served for Borghese. Borghese himself fled to Spain and died there in August 1974. On March 18, 1971, the leftist journal Paese Sera was published with the headline: Subversive plan against the Republic: far-right plot discovered. The first arrests concerning the coup attempt were made on the same day. The first people arrested on March 18 and 19 were Mario Rose, a retired army major and National Front secretary, Remo Orlandini, also a former army major, a real-estate proprietor and close associate of Borghese, and Sandro Saccucci, a young paratrooper. An arrest warrant for Borghese was also served, but he could not be found. Later arrestees included businessman Giovanni De Rosa and a retired Air Force colonel, Giuseppe Lo Vecchio. The investigation into the coup attempt was resurrected after Giulio Andreotti became defense minister again. Andreotti handed over a report by the secret service to the Rome public prosecutor in July 1974. The report revealed a detailed knowledge of the inner workings of the conspiracy and it was clear that some of the conspirators counted on members of the secret service as trusted confidants. Shortly thereafter General Vito Miceli, a former head of SID, was brought for questioning before the investigating judge. Miceli's interrogation led to his arrest two days later. Miceli was then sacked, and the Italian intelligence agencies were reorganized by a 1977 law. Three trials were started for conspiracy against the Italian state. In 1978, Vito Miceli was acquitted of trying to cover up a coup attempt, Saccucci, Orlandini, Rosa, and others were convicted of political conspiracy, which also included Stefano Delle Chiaie, whose specific role is unclear. According to a 1987 UPI news cable, he had already fled Italy to Spain on July 25, 1970. However, according to other sources, including René Monzat (1992), he led the commando which occupied the premises of the Interior Ministry. At the appeal trial in November 1984 all 46 defendants were acquitted because the "fact did not happen" (il fatto non sussiste) and only existed in "a private meeting between four or five sixty-years-olds". The Supreme Court confirmed the appeal judgment in March 1986. The final trial connected with the Golpe Borghese began in 1991, after it was discovered that evidence involving prominent persons (Licio Gelli and admiral Giovanni Torrisi) had been destroyed by the Italian armed forces secret service before the first trial. Giulio Andreotti, minister of defence at the time the evidence was destroyed, declared in 1997 that names had been deleted so that the charges would be easier to understand. This last trial ended without convictions because the period of prescription for destruction of evidence had passed. According to the journalist René Monzat, investigations lasted seven years, during which it was alleged that the Golpe Borghese had benefitted from military accomplices, as well as from political support not only from Borghese's National Front or from MSI deputy Sandro Saccucci, but also from other political personalities belonging to the Christian Democracy (DC) and to the PSDI (Italian Democratic Socialist Party). According to Monzat, investigations also discovered that the military attaché at the US embassy was closely connected to the coup organizers and that one of the main accused declared to the magistrate that US President Richard Nixon had followed the preparations for the coup, of which he was personally informed by two CIA officers. These facts were confirmed through a Freedom of Information Act (FOIA) request by the Italian newspaper La Repubblica in December 2004. However, only a few marginalized sectors of the CIA were in favour of the coup, while the main response was not to allow major changes in the geo-political balance in the Mediterranean. According to several ex-Mafia state witnesses ("pentiti") such as Tommaso Buscetta, Borghese asked the Sicilian Mafia to support the neofascist coup. In 1970, when the Sicilian Mafia Commission was reconstituted, one of the first issues that had to be discussed was an offer by Borghese, who asked for support in return for pardons of convicted mafiosi like Vincenzo Rimi and Luciano Leggio. The mafiosi Giuseppe Calderone and Giuseppe Di Cristina visited Borghese in Rome. However, other mafiosi such as Gaetano Badalamenti opposed the plan, and the Mafia decided not to participate. According to Mafia boss Luciano Leggio, testifying at the Maxi Trial against the Mafia in the mid-1980s, Tommaso Buscetta and Salvatore "Ciaschiteddu" Greco were in favour of helping Borghese. The plan was for the Mafia to carry out a series of terrorist bombings and assassinations to provide the justification for a right-wing coup. Although Leggio's version differed from Buscetta's, the testimony confirmed that Borghese had requested assistance by the Mafia. 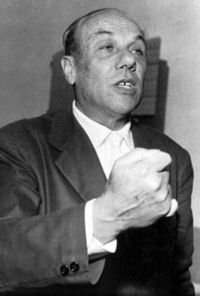 According to the pentito Francesco Di Carlo, the journalist Mauro De Mauro was killed in September 1970 because he had learned that Borghese – one of De Mauro's childhood friends – was planning the coup. The botched coup has gone down into history as "a comic-opera coup staged by naive incompetents, which posed no real threat to the state" and newspapers wrote about it as "the coup that never was". However, the secret service report revealed serious connections of the conspiracy with US President Richard Nixon's administration and with NATO units based in Malta. A comic film directed by Mario Monicelli and starring popular Italian actor Ugo Tognazzi was released in 1973 and was in the selection of Italian films for the 1973 Cannes Film Festival. It is called Vogliamo i colonelli (We Want the Colonels, in reference to the contemporary US-backed Greek fascist military dictatorship). In this film Tognazzi portrays a boisterous and clumsy far right Italian MP called Tritoni trying to stage a coup d'état against the legitimate Italian republican government. Though the botched attempt sinks in ridicule and chaos, and Tritoni has to go in exile, right wing political measures are nevertheless enforced, such as forbidding labor strikes and political gatherings. The character's name Tritoni (Triton) is a direct reference to Borghese and his military past as the leader of an assault frogmen unit. The film is peppered with joke references to the fascist period, the post-war neo-fascist Italian Social Movement and the Decima MAS frogmen unit. ^ "Rome Police Arrest Another in Alleged Neo-Fascist Plot". The New York Times. March 21, 1971. p. 29. ^ "Colonel Arrested on Rome Plotting Charge". The Times. March 24, 1971. p. 6. ^ "General to Tell of Coup Attempt". The Times. October 29, 1974. p. 8. ^ "General Who Led Intelligence Agency Arrested in Italy". The New York Times. November 1, 1974. p. 5. ^ "Jail Terms for 1970 Italian Coup Plotters". The Times. July 15, 1978. p. 3. ^ "Neo-fascist held in isolation to await questioning". United Press International. April 1, 1987. (in Italian) Relazione della Commissione Stragi su "Il terrorismo, le stragi ed il contesto storico-politico": cap. VI, "Il c.d. golpe Borghese"